We continue to step our way through a short list of identified hallmarks of Agile through the lens of Levels of Work. Today, we move down the list to the people model. Levels of work identifies a robust framework where each role is defined by its level of decision making and problem solving. Effective decision making and problem solving at each level of work requires a concomitant level of cognitive capability. In the transformation from analog to digital, there will be obsolete roles no longer needed and new roles created. As new roles are created, the organization has to identify the level of work in the new role and the corresponding cognitive capacity of the candidates for those roles. When people are challenged to work at or near their highest level of capability, in work they value, there is no need for motivational speakers to raise morale. 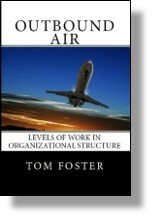 This entry was posted in Accountability, Levels of Work, Organization Structure, Time Span and tagged decision making, levels of work, problem solving on January 28, 2019 by Tom Foster.